UK Prime Minister David Cameron and French President Francois Hollande agreed on Monday that a deal on the draft renegotiation document on UK membership of the European Union may be reached at the next EU Summit, the Downing Street said in a statement. 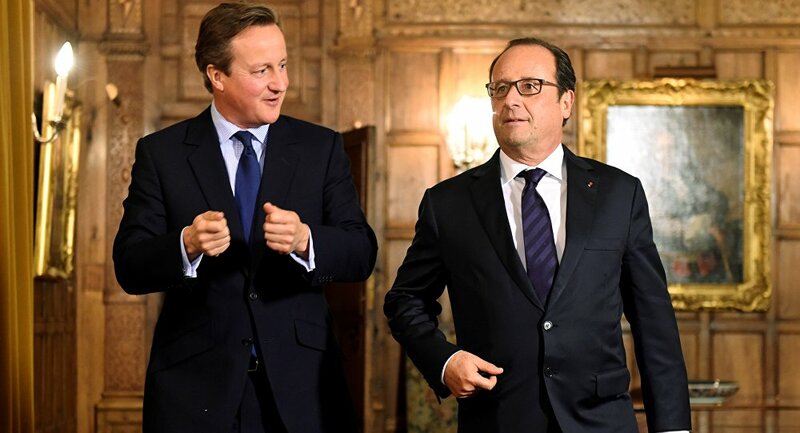 LONDON (Sputnik) — Cameron and Hollande met at the Elysee Palace earlier in the day. "They agreed that we are making good progress on the UK renegotiation and that the draft text from the European Council provides a firm basis to reach agreement at this week’s summit," the statement reads. Cameron pledged to hold a referendum on the United Kingdom's future within the European Union by the end of 2017. Ahead of the vote, the British prime minister is seeking to revise the terms of the country's membership in the bloc. The European Council is scheduled to meet in Brussels on February 18-19 to discuss the UK referendum plans.